This post is sponsored by Lentils.org. Thanks for supporting those who keep The Kitchen Paper up and running! I have a new obsession: sprouting grains. I can’t stop! We’ll dive into that in a minute, but first let’s just talk about this bowl. Sprouted lentils (did you even know you could do that?! ), which require exactly zero cooking, all the roasted veg (hellooooo meal prep! ), arugula, fried egg, radish, and avocado. So many delicious things in one bowl, I just can’t stop! I was lucky enough to go to a dinner with Canadian Lentils earlier this summer, where chefs from the Toro Bravo family here in Portland cooked lentils in a variety of creative ways — breaking away from the traditional, and demonstrating how versatile lentils really are. Lentil dessert crepe? It (which I instagrammed after the event) was amazing, and absolutely broke the barrier of what lentils are “supposed” to be used for. 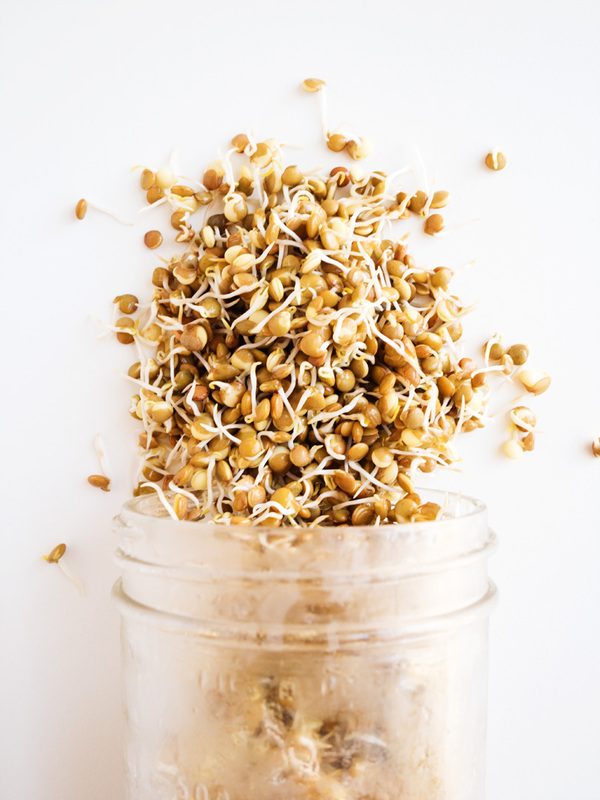 Honestly, sprouting grains wasn’t something I’d really ever considered doing until I had a conversation with a friend about the health benefits of sprouting. I’m not against eating grains and pulses in their normal form, but I do acknowledge that the entire purpose of a grain/pulse is to be a seed. What are seeds for? Passing through an entire digestive track unharmed before sprouting and growing. That means, in many situations (and depending on your personal digestive system) we aren’t getting all of the nutrition we could be getting. Enter: sprouting. Sprouting gives the seed a chance to germinate, open up, literally start growing, and gives us access to the nutritional benefits! I’ve read before that sprouting cuts out 95% of the enzyme inhibitors that cause some people digestive issues — so if you have digestion issues with grains/pulses, this might be your method!! I’ve tried multiple grains (wheat berries, quinoa, etc.) with success, but lentils are my go-to. They’re so high in protein, so quick and easy. If you’re sprouting, you literally just soak overnight, then drain and put in a jar (covered with mesh/cheesecloth) for a few days. I rinse and drain mine every 12 hours, and usually have fully sprouted lentils within 48 hours. They have an amazing crunchy texture, which I love adding to salads and bowls like this one! Keep in mind that whatever amount you start out with will nearly quadruple in volume — I usually do about 1/4-1/2 cup, and end up with at LEAST 2 cups of finished sprouted lentils. This bowl absolutely could be made with cooked lentils, if that’s more your speed, but I encourage you to try sprouting at least once — it really has changed my approach to grains and pulses (do your own research, too! It’s pretty convincing!). The rest of this bowl is a subtle encouragement for meal prep: a variety of roasted vegetables, and other things I keep in the fridge during the week. 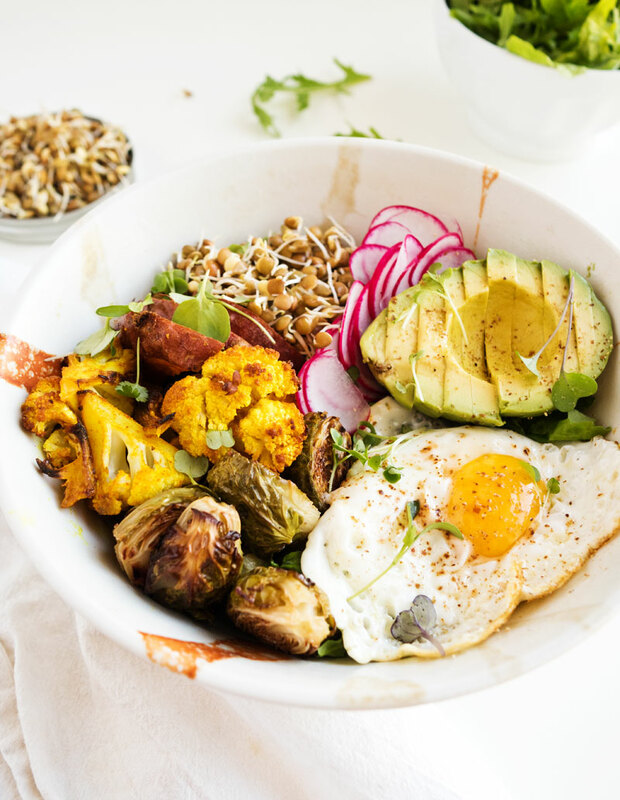 I love starting my mornings with a savory bowl full of vegetables, topped with a fried or poached egg. I feel healthy and energized, and it sets me up for having a much healthier day. I’ve written a psuedo-recipe below, but really… just throw together a variety of roasted vegetables on a bed of leafy greens, add some healthy fat (I chose avocado, but nuts would work, too! ), and an egg! It’s hard to go wrong. What are your favorite ways to cook lentils? Any new ideas I need to try!? 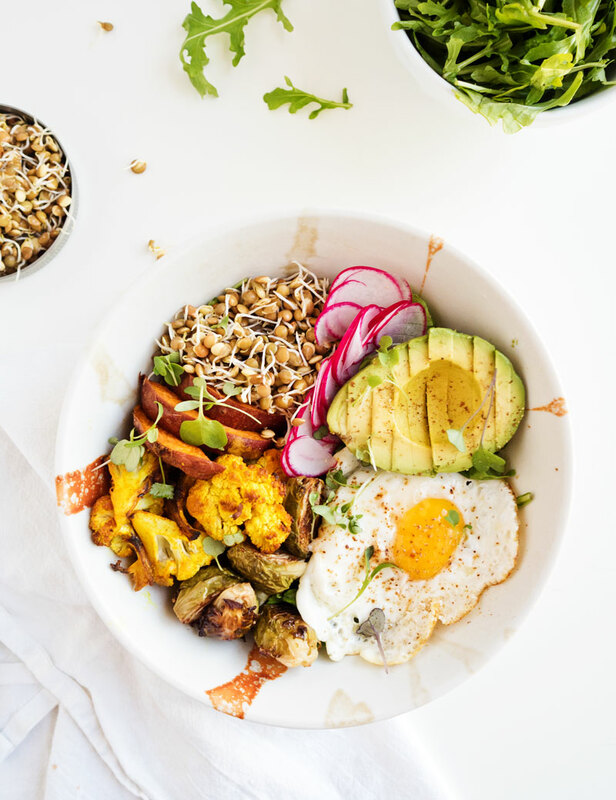 This healthy breakfast featured roasted vegetables and sprouted lentils, delivering a nutritional punch! Add whatever extras you want, and throw a fried egg on top for a filling, healthy start to the day. Soak your uncooked lentils in clean water for 12 hours. Drain, and return to a jar. Cover the jar with mesh, or cheesecloth, and secure. Let the jar sit at room temperature for 2-3 days, but uncover, rinse, and drain the lentils every 12 hours or so. The sprouts are done when you can visibly see sprouts at least 1/2″ long. Rinse one final time, let dry a bit, then refrigerate in a sealed container. Eat within 3 days. In a bowl, layer arugula, roasted vegetables, sprouted lentils, avocado, and radish. Add any other vegetables you’d like! Fry or poach an egg, add it to the bowl, and enjoy! Great post! I have never tried sprouting but now I want to! 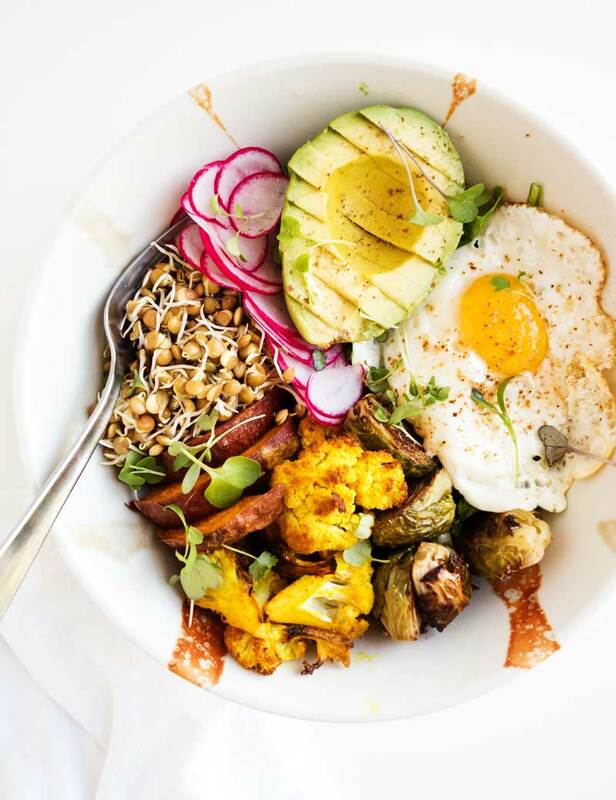 This breakfast bowl looks delicious.